As you read in a previous post I recently ordered a 1BandID. You haven’t heard of them? Well, they’re new. 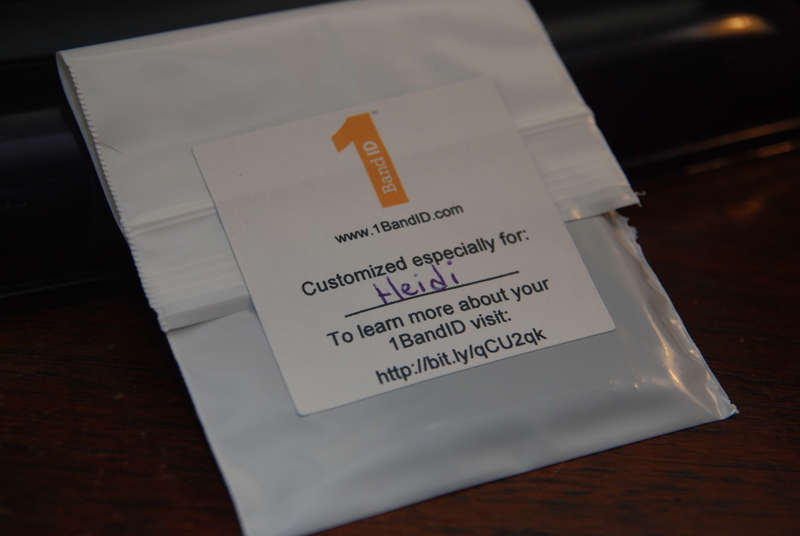 1BandID is different than other ID bracelets or dog tags that you wear in addition to your watch, GPS or HR monitor. Unlike those other products, 1BandID is the first and only athlete ID that securely attaches to and displays critical contact and medical information on your watch, GPS or Heart Rate Monitor band. I first “met” the creator/owner, Joe, on Twitter. I stumbled upon the 1BandID site and I finally realized that Joe was the brains behind the product. After seeing his idea I wanted to get my hand on one of those bad boys. It’s such a great idea. Through a contest on 1BandID’s Facebook page I was named a winner of a free 1BandID. Woot! It arrived this week! 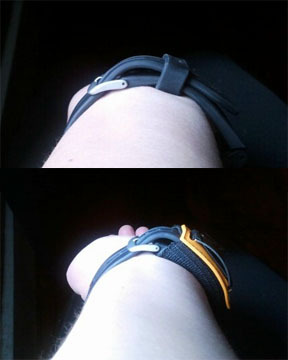 I hate to compare two products, such as the already existing RoadID, which I’ve had for several years. However, I’m going to do so, because it’s what I’ve experienced, what I can compare to, and what most people will want to know (is one better than the other?). First impressions: How cute is this little bag it comes in? I know the idea is so simple, but in my mind it gives a little extra personal touch. Also, the size of the metal part is a tad smaller that the RoadID. With that being said, the font size isn’t much different and is very legible. Most people will put the 1BandID on the strap where the holes are for putting on your watch. 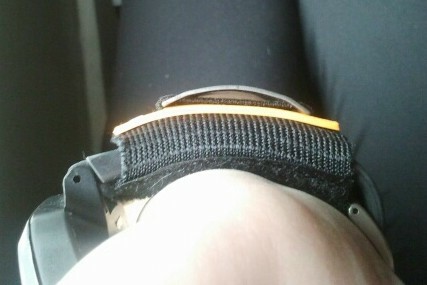 Anyone with a smaller wrist will have to put the product on the opposite strap (clasp side). As you can see, I removed the little piece of rubber that holds down the excess strap and instead put the 1BandID in its place. The 1BandID will now do the “job” of that little rubber piece I removed. The biggest question: Is it bulky? No, not really. 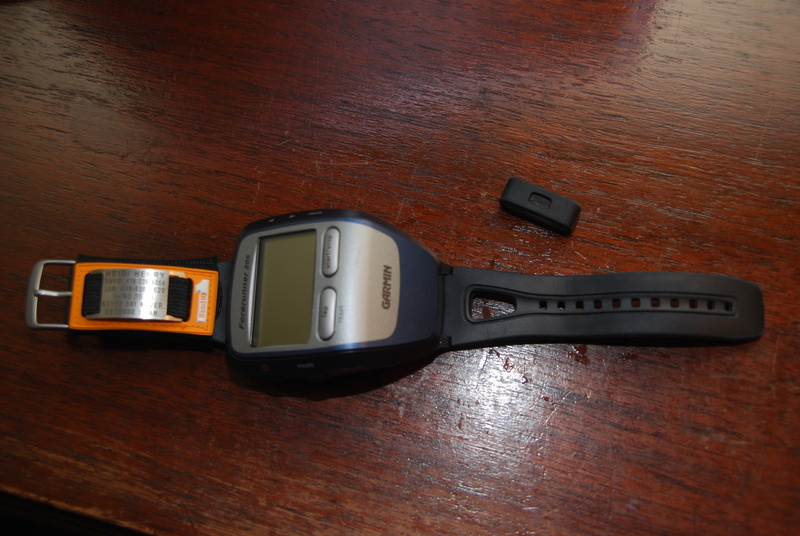 To be honest my Garmin is already pretty bulky, which I’ve gotten used to. This little piece of fabric/metal made no difference whatsoever. Even with a smaller watch I don’t think I’d give notice to the 1BandID. It’s light and flexible. Here’s a before and after shot of my wrist. As you can see, there’s no big difference. 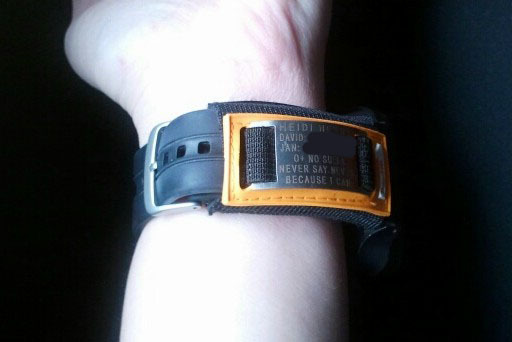 Drawbacks: I wish I could place it on the strap it was intended for (strap with the holes), so it’d be easier to look down and see my mantra. Alas, this is not the product’s fault. My wrist is just small. And I can easier flip my wrist around and see it just as easy. My other issue is my Garmin’s not waterproof, so if I go swimming I will still need my RoadID. Once again, that’s not the product’s fault. I hope to upgrade my Garmin in the future to something that’s waterproof, which will void out this issue. Final thoughts: This is an excellent idea and a fantastic product. I was thrilled with 1BandID’s customer service and speed and would highly recommend this product. Joe is such a great guy that not only did I get a complimentary 1BandID, but he wants to pass on some savings to you too! When ordering, use the code heidi64284 upon checkout and you’ll receive 10% off. Very cool! Previous Where Are You Christmas? That’s great! I heard about this product on twitter (from you, I believe) and intend to order one. The 10% off code definitely motivates me to order it sooner rather than later. Oh and safety, that too. I got one too. I was really surprised how comfortable mine is. I’m definitely retiring my RoadID. Comfortable enough so that I never notice it, but visible enough that any first responder would.